It's Albert from Seattle Gay News, in Vancouver BC for tonight's Coldplay concert with opening act Snow Patrol at GM Place. The first of back-to-back performances took place last night, and I'm told by a father and teenage son - who are staying at my hotel (L'Hermitage Hotel, fab place to stay in Vancouver!) and went to the gig - that it's an early show - supposedly, Snow Patrol goes onstage around 7:30 or 7:45, then Coldplay jumps on at 8:15 or 8:30. Last night's concert was also being taped, as part of an upcoming Coldplay DVD special or release - not sure if tonight's show will be taped as well. I'm told there are two excellent places to pre-funk before any concert in Vancouver, the Granville Room (957 Granville Street) and Chambar (562 Beatty Street) - so I'm hitting both on my way to the concert. Coldplay is one of the world's most popular bands, and photos of the show were available on the Vancouver Sun's website just minutes after their performance last night. The Grammy-winning rock band is currently still touring their top-selling album Viva la Vida or Death and All His Friends. 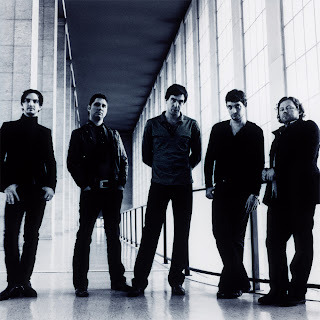 Meanwhile, Snow Patrol has kept low-key since its third US release, A Thousand Million Suns, and has ignored the West Coast almost entirely on their 2008 and 2009 tour itineraries. I've got a floor seat for tonight's big show at GM Place - so I'm very excited. Look for a review of Coldplay and Snow Patrol's performances in the June 26 issue of Seattle Gay News! Nice article as for me. It would be great to read something more concerning this topic. Thank you for giving that material.